As a bona fide hostess, I love any excuse to get friends together! An after-work happy hour is the perfect solution to squeezing in some socializing to our busy lives. 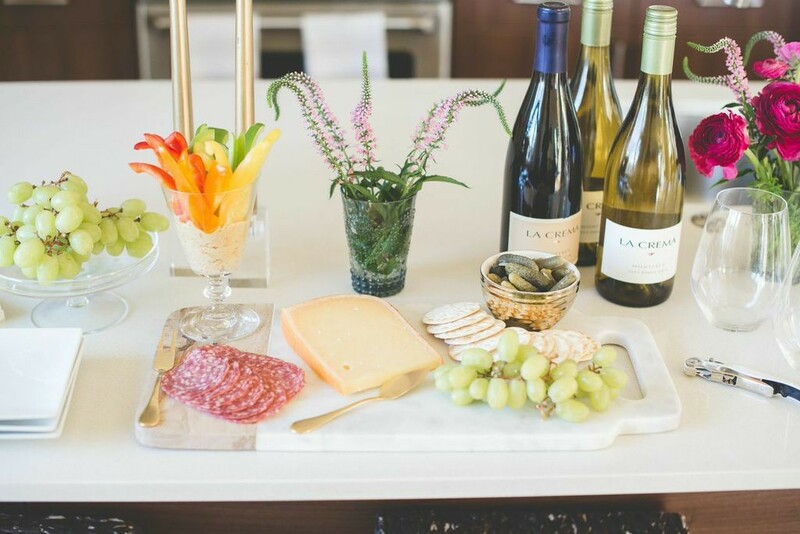 We’re used to the lure of happy hour at restaurants and pubs, but there’s no reason you can’t take inspiration from the idea and host your own at home! 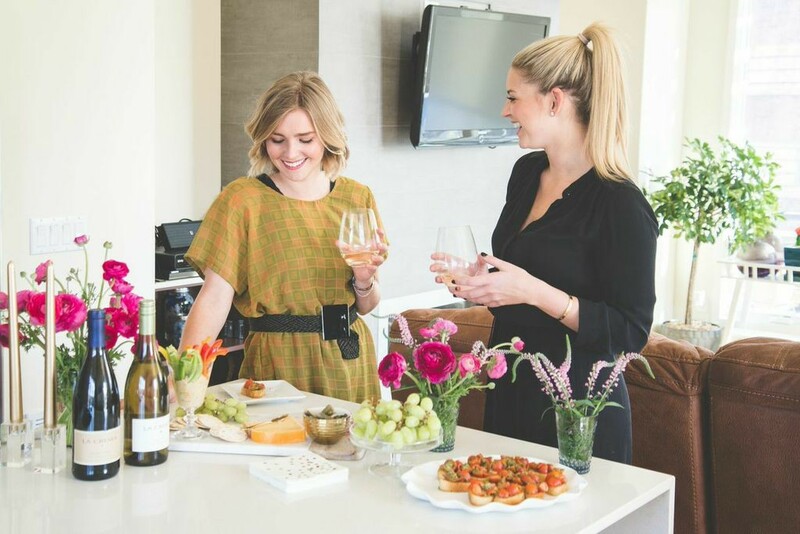 Hosting your own happy hour get-together is a simple way to welcome people in your home without the stress of preparing an entire dinner party. 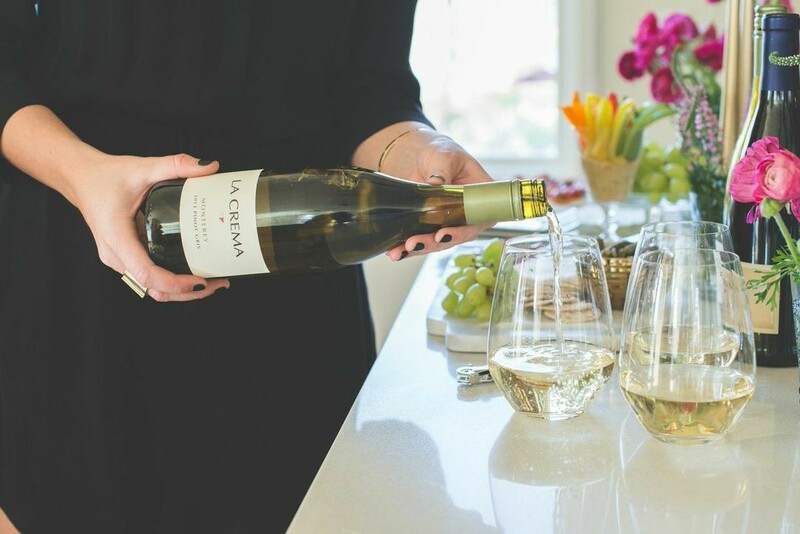 Here are five easy steps in creating a great at home happy hour – equipped, of course, with La Crema wine! Have guest plan to come from five until seven pm! Keep it simple! Make less work for yourself and focus on things that you can prepare beforehand or put together quickly. 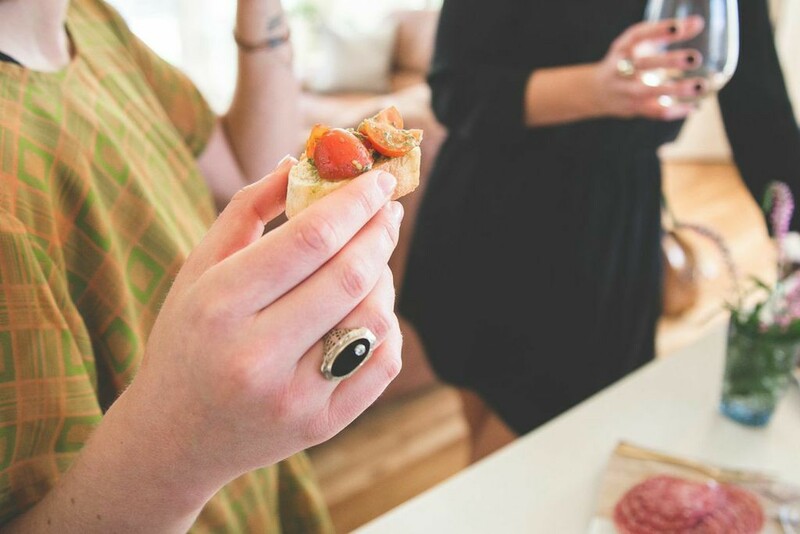 Serve bite-sized food that doesn’t require using utensils so guests can skip the formalities of having to sit down at a table setting. Head to The Every Hostess for a perfect easy pesto bruschetta recipe! 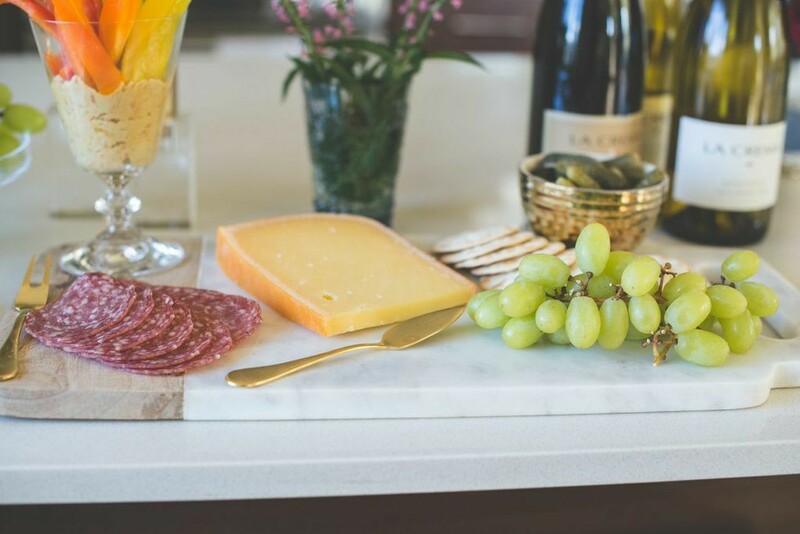 With it, serve a charcuterie board that compliments the wine you’ve chosen, with a tempting assortment of cured meat, olives, nuts and grapes to accompany the cheese. La Crema Monterey Pinot Gris and Pinor Gris are great choices for a happy hour! Again, don’t make things complicated. 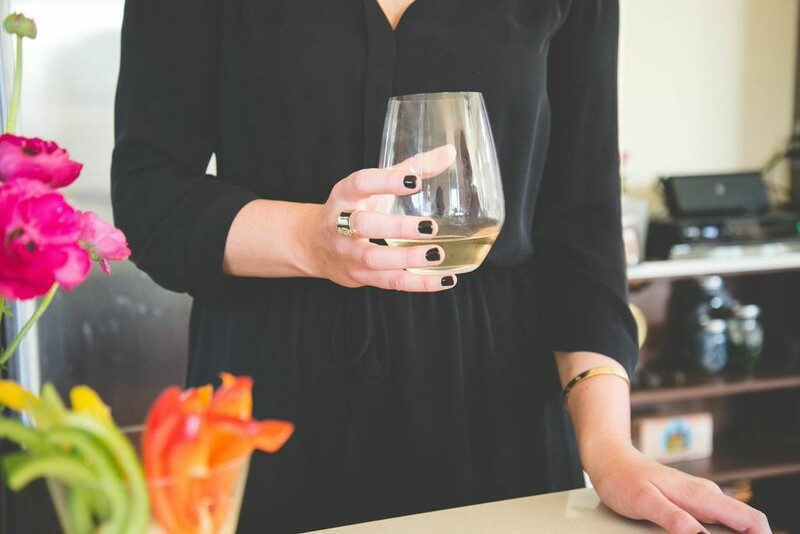 Great wine is really all you need to serve at your happy hour, so long as your guests are all wine drinkers. You can even turn it into a miniature wine tasting. 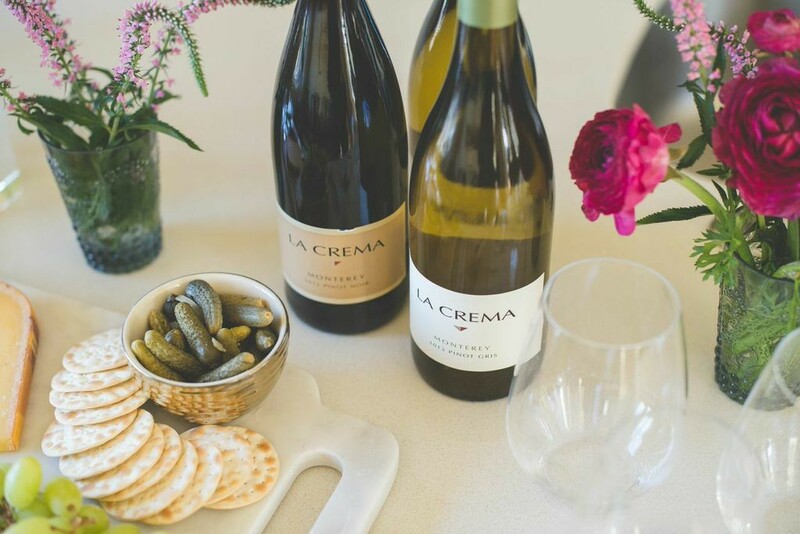 I love the La Crema Monterey Chardonnay or the Pinot Gris to start off with, because they are refreshing and among the most food-friendly varietals around. Mix it up and offer a red as well, such as the Monterey Pinot Noir. 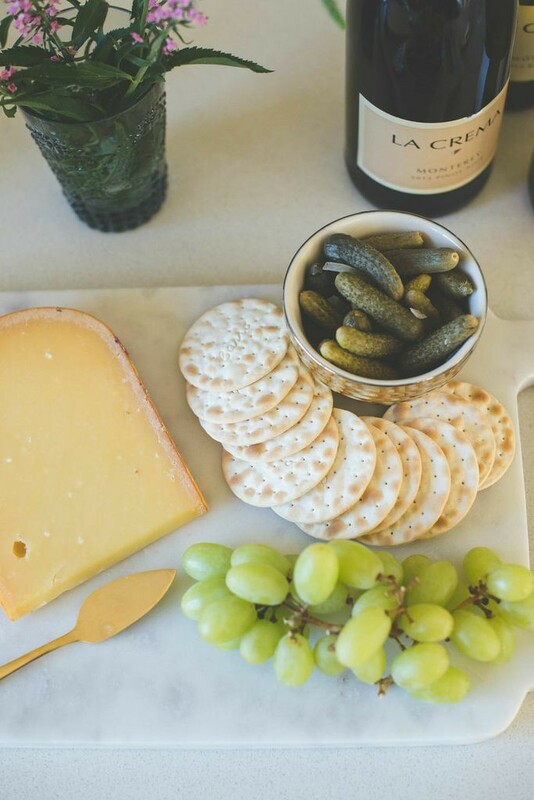 Stick with the lighter wines for a happy hour that will go with your light bites, since typically most people will drink heavier wines at dinners. A simple spread makes for a stress free set up! 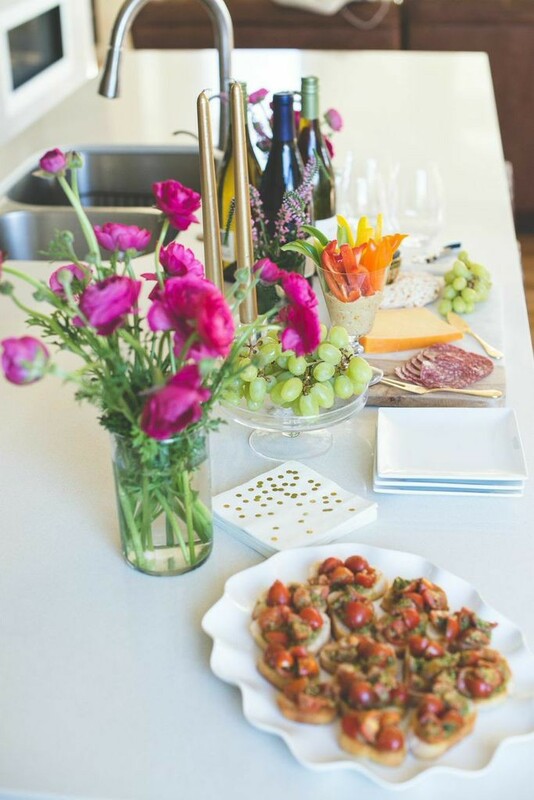 A seasonal flower arrangement and colorful food is all you need to make your happy hour area appealing. Whole Foods is a great place to pick up gorgeous fresh flowers without entirely breaking the bank. 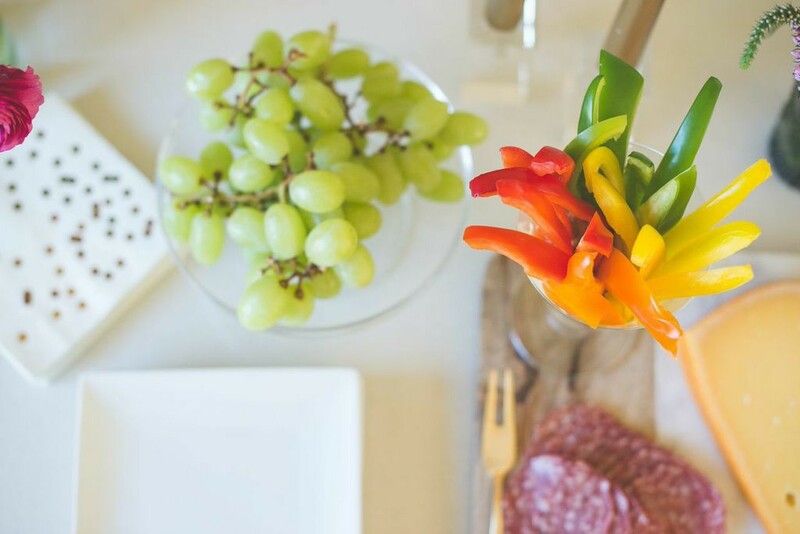 As a little hostessing rule of thumb, know that when arranging your food, it makes your spread more visually appetizing if you incorporate greens. Sometimes our color palate can be overwhelmed with the bland hues of yellow and brown. Avoid that! Add colorful flowers to brighten up your spread! Don’t forget, the “happy” in “happy hour” should apply to the host or hostess as well! It should be a fun and stress-free event for everyone, including you. 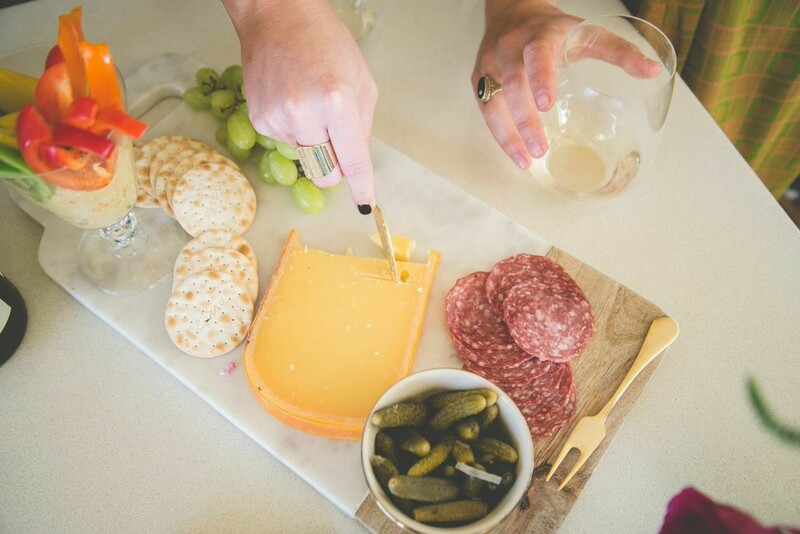 With light bites and two or three wines to choose from, your happy hour should be – key word – simple. In my experience, people love to gather around the kitchen, especially if you have an open kitchen concept in your home. 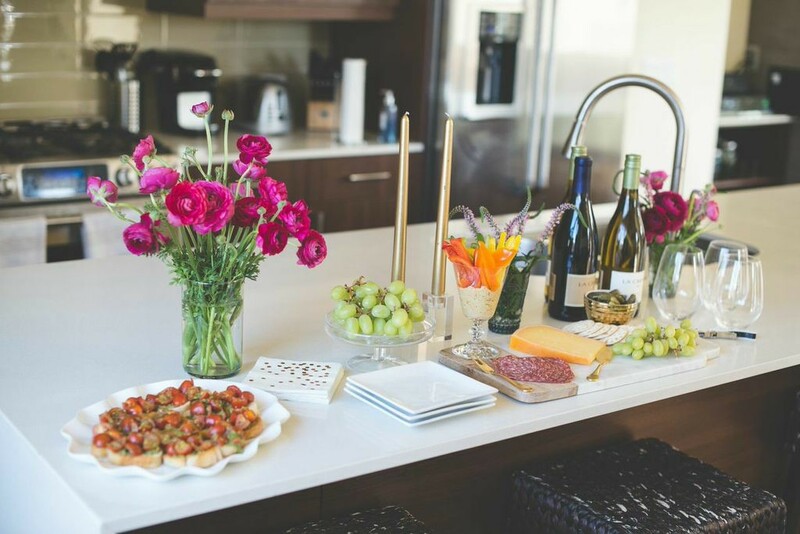 Inspire this informal and relaxed atmosphere for guests by laying out your food and wine on the kitchen island or on a coffee table gathered around the couch, so everyone can engage in conversation together. 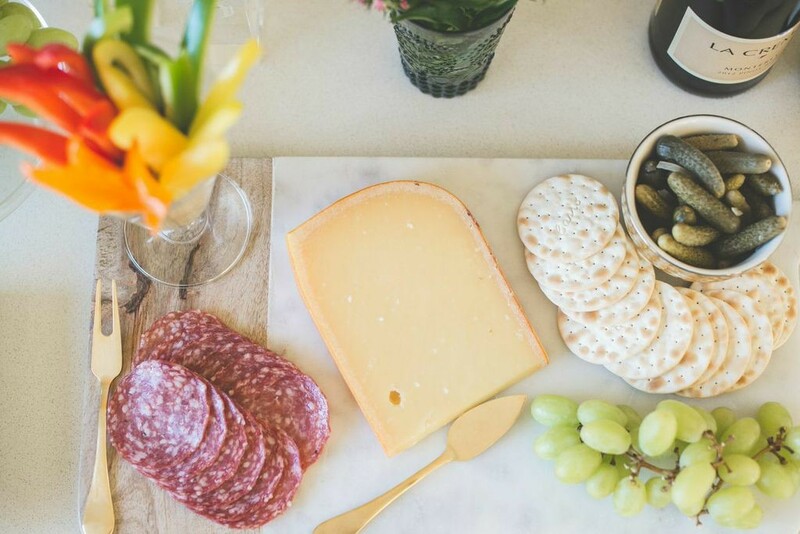 Pair the wine you choose to drink with cheese and assortments. La Crema Pinot Gris is perfect for a happy hour! A fun excuse to get together with your friends! 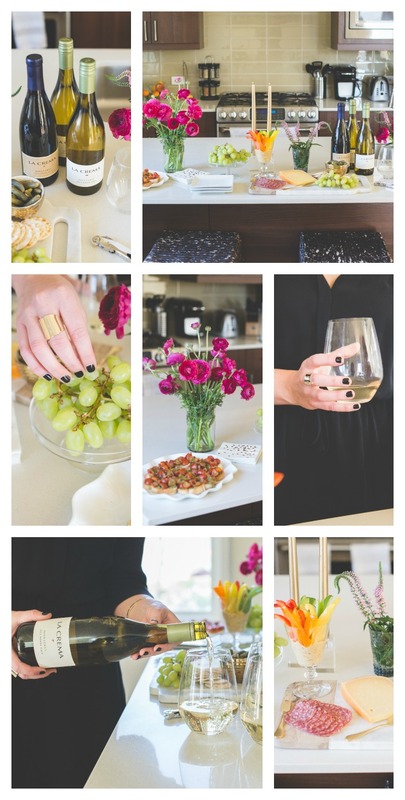 Head to The Every Hostess for a simple Bruchetta recipe! Host your happy hour before dinner and make it clear to your guests that it is okay for them to have other dinner plans. Just make sure that your guests are aware of the evening’s plans, whether you’ll be splitting off from each other to make alternate dinner arrangements or if you’ll be heading out to a restaurant as a group. Around 5 p.m.-7 p.m. is the perfect timeframe. That way, you’ve got enough time to catch up with your friends, but you avoid the awkward lingering that occurs when people don’t know when the night is meant to end. Have light bites so your guests don’t have to sit to eat! As always, keep things uncomplicated and casual. Hostessing is as much about enjoying your guests as it is ensuring things are welcoming and well organized. 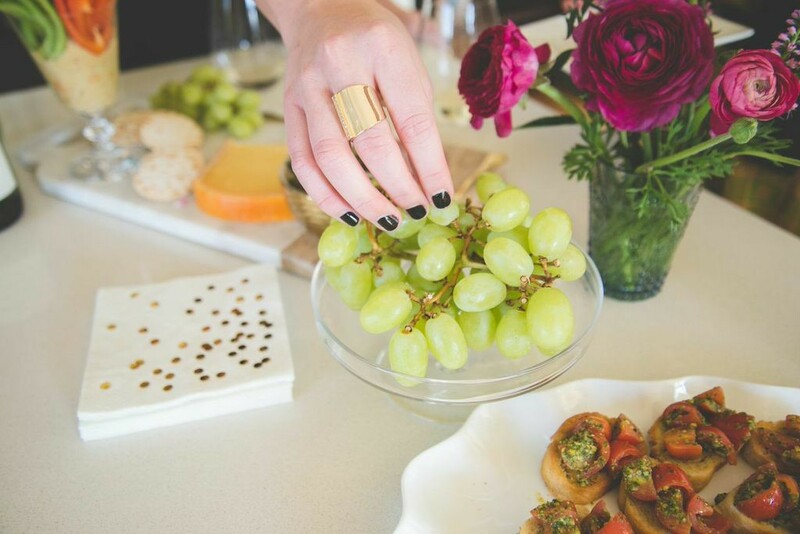 Good wine, good food, and good conversation are all you need to make your happy hour a success! As always, keep things uncomplicated and casual.